Not implementing lightning and surge protective measures at PV installations is a recipe for disaster in countries such as South Africa. 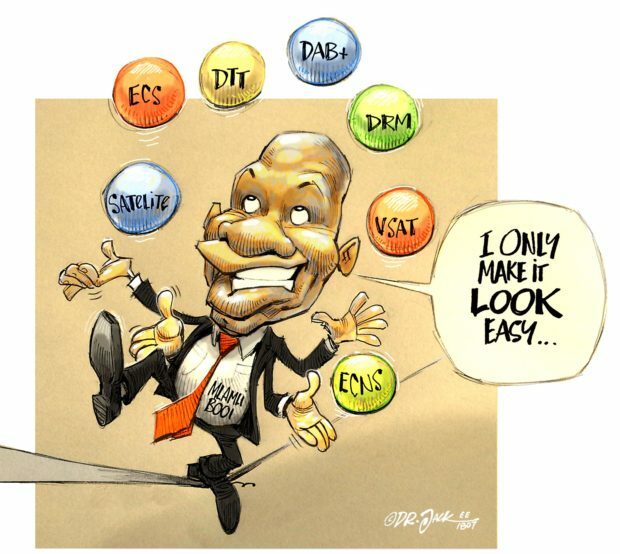 South Africa is seeing the rise of small-scale embedded generation (SSEG) as end-users and businesses alike work towards reducing their reliance on the national grid. Small-scale embedded generation refers to power generation under 1 MVA, such as through the use of photovoltaic (PV) systems or small wind turbines located at residential, commercial or industrial sites. The topic of SSEG in South Africa came under the spotlight at a joint EE Publishers/South African Institute of Electrical Engineers (SAIEE) conference held at Emperors Palace, Gauteng, in late October 2018. The SSEG seminar was part of the SA Energy Storage 2018 conference. Surges often cause considerable damage to PV systems. 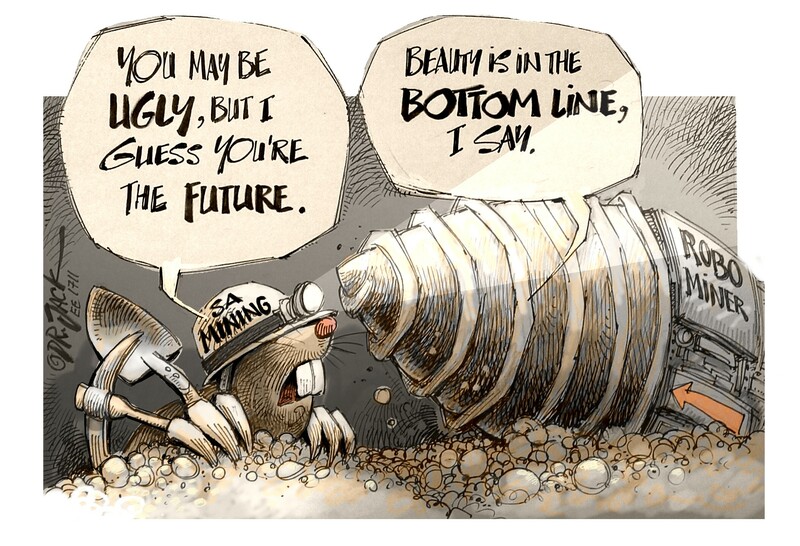 The resulting reinvestment costs are high, delaying the return on investment and postponing the break-even point. Looking at the type of damage that lightning can cause to unprotected or inadequately protected solar installations is a sobering exercise. There have been a number of incidents where significant damage to small-scale plant has occurred as a result of direct and indirect lightning strikes, as well as surges. These incidents often result in damage to solar modules, combiner boxes, inverters, communication systems and sensitive equipment such as trackers and security systems, as well as to sensing and other instruments. The installation of a lightning protection system (LPS) on electrical equipment is imperative for a number of reasons. 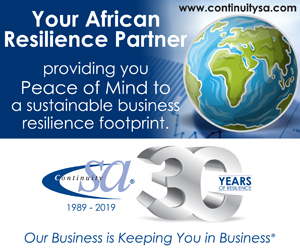 Renewable energy systems represent a costly investment and must last at least 20 years to be viable; return on investment is linked to the kWh output; downtime is caused when components are damaged and there are insurance costs and subsequent insurance hikes when components are damaged. Fig. 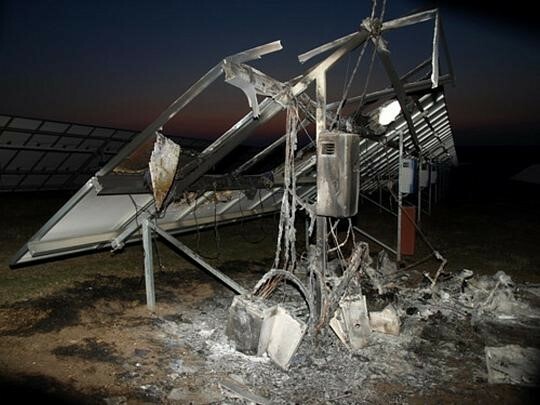 1: Damage to a PV installation as a result of a direct lightning strike. The objective is a maximum performance ratio for the system. A sound lightning and surge protection concept helps to optimise system availability. Rooftop systems are extremely exposed and therefore particularly prone to damage caused by direct and indirect lightning effects. Since the PV system is directly connected to the electrical installation of the building, lightning effects can have severe consequences for the building itself, the occupants and to electrical devices. PV modules do not increase the risk of a lightning strike, which means that the need for lightning protection measures cannot be derived directly from them. With respect to solar farms, it has been noticed in the past that the trend is often to call companies in for retrofitting of lightning and surge protection. 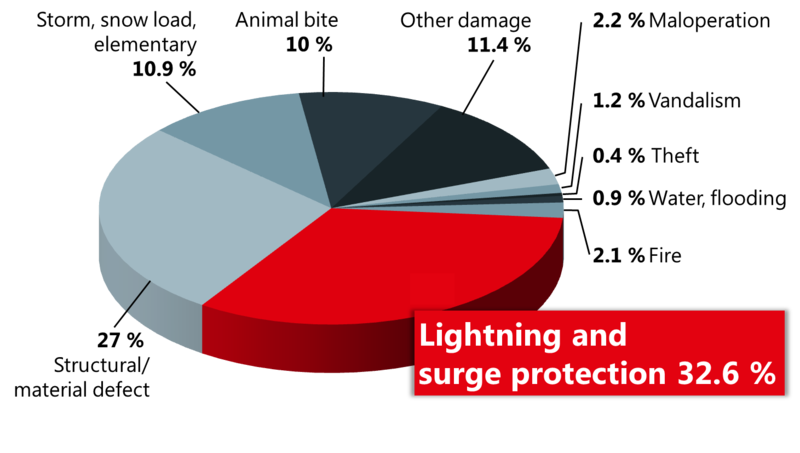 From an economic point of view, the topic of lightning and surge protection should be integrated in the planning of the PV system right from the start – retrofitting is significantly more expensive. As a result, valuable equipment at a number of different sites has suffered significant damage from lightning related surges and direct strikes. Companies are now increasingly approached at the design stage to protect these renewable energy projects. Fig. 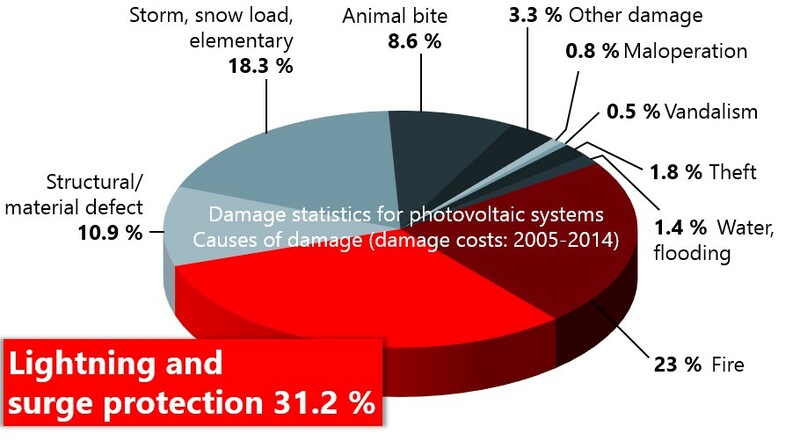 2: Causes of damage, 2005 to 2014 . The German national supplement 5 of DIN EN 62305-3 describes protective measures for external and internal lightning protection when using PV power supply systems. Implementation of the protective measures described has also proven its worth on an international level . Lightning protection company DEHN recommends type 1 arresters because these protective devices can be installed upstream of the meter and offer additional protection against partial lightning currents. These provide optimum protection for devices such as smart meters. Buildings with PV systems, without external lightning protection. Buildings with PV systems, with external lightning protection and sufficient separation distance. Buildings with PV systems, with external lightning protection, without sufficient separation distance. IEC 60364-7-712 and IEC 61643-32 describe type 2 arresters as protective devices. Europe is far more advanced and mature in the renewable energy sector than South Africa is, and two studies from Europe have shown that lightning and surge damages contributed to almost a third of the total damages shown over a period of ten years. The concerning fact is that the lightning flash density is almost ten times higher per square kilometer in South Africa than in Europe [1, 2]. Fig. 3: Cost of damage, 2005 to 2014 . These statistics outline very clearly why a risk assessment is needed at the outset of any renewable energy site project, to calculate if and what level of lighting protection is needed. Such an assessment would outline factors such as tolerable risk values; possible sources of damage; risk compositions; the expected frequency of lightning strikes in the area; the probability of damage in the event of such a strike, and the resultant types of loss that could be expected. These factors together, as well as information such as the plant’s output, in kWp; the area it covers, in km2; the expected annual lightning density, and the expected annual direct and indirect lightning events, can provide estimates of the total lightning loss in the event of a lightning strike to an unprotected plant (see Table 1). Table 1: Factors to be considered when calculating potential loss by lightning. It is necessary to protect the electrical components on the AC and DC sides, as well as any data interfaces. The protective devices should be installed as closely as possible to the device to be protected – the inverter, for instance. An additional type 2 surge protective device is required if the line between the surge protective device and the inverter (as an example) exceeds 10 m in length. The same applies to battery storage systems. No further protective devices are required if the storage system is in the immediate proximity (under 10 m) of the surge protective device. It is always advisable to favour a lightning protection system which, taking the required separation distance into account, has no direct connection with the PV power supply system. Heightened environmental awareness, dramatic increases in the price of electricity, the rapidly decreasing cost of PV panels and the risk of national power blackouts have all resulted in electricity distributors around the country receiving numerous requests to allow electricity users to connect PV and other SSEGs to the electricity grid. The industry expects to see a rapid rise in SSEG plants going forward and the case for the inclusion of surge and lightning protection measures from the inception of such projects is indisputable. 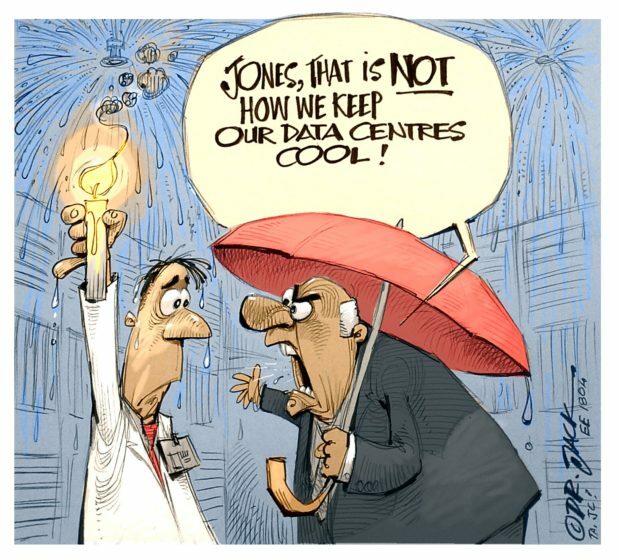 In a lightning-prone country such as South Africa, not implementing such protective measures is a recipe for disaster threatening a very valuable investment. Mannheimer Versicherung, 2003 to 2013. Bayerischer Versicherungsverband, 2005 to 2014.